If you're bored of all that sunbathing or had your fill of ice creams then why not drop in to the local kart circuit in Worthing? 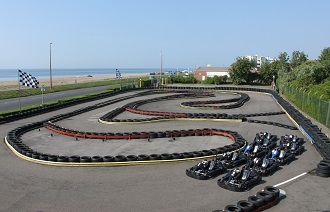 The track is an outdoor venue located right on the seafront so it's difficult to miss and is nicely laid out so as to provide a thrill for novices and 'keen' drivers. The events are geared more towards track experience rather than specific race formats but for those of us who simply want to be the fastest kid on the block this is just fine. It's on the seafront so you can't miss it. The 700 bus stops right outside, the nearest station is Lancing and it's five minutes drive from Worthing town centre. A 30-minute session for three drivers. A 30-minute session for four drivers. A 45-minute session for six drivers. A 45-minute session for eight drivers. A 60-minute session for ten drivers. A 60-minute session for twelve drivers. An opportunity for adult an junior family members to have a go at karting - please call for prices and event duration. The venue has 8 specific cadet/junior karts.